Damhotel v Amsterodam, Nizozemí: Zarezervujte nyní! The hotel/hostel offers rooms for 1 to 10 persons with attractive prices. Our multi-lingual personals are looking forward to serving you and provide all the necessary information about our lovely city. Please note that the reception is located on the first floor of Damrak Street No. 32. 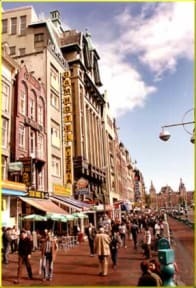 Reception desk staff will be happy to assist you in arranging various excursions including Amsterdam Canal boat tours, exciting trips to the typical Dutch village Volendam, excursions to Madurodam (the Miniature City) and much more. We are looking forward to having you in our hotel/hostel and will make your stay as pleasant as possible. Special conditions are prior to the main cancellation / modification conditions when applied. -Hotel will do pre-authorization for first night room rates to guarantee the reservation, this amount will unblock around 15 bank working days automatically.